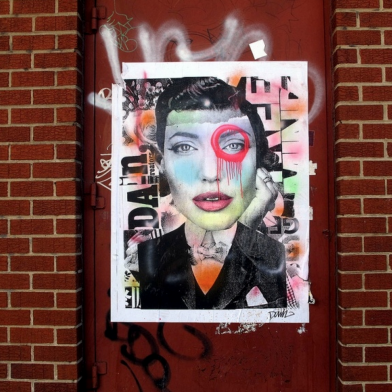 DAIN, born and raised in Brooklyn, has emerged as one of the most recognizable names in urban art worldwide. Combining black and white photos and the bright, intense colors of graffiti art, he creates smoldering paintings that pay homage to the classic Hollywood glamour of the 1940's and 1950's and its representation of the feminine mystique. 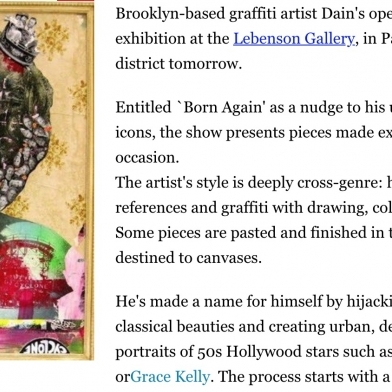 Dain views his work as a confrontation between the destructive gestures of graffiti and the femininity of his Hollywood subjects. 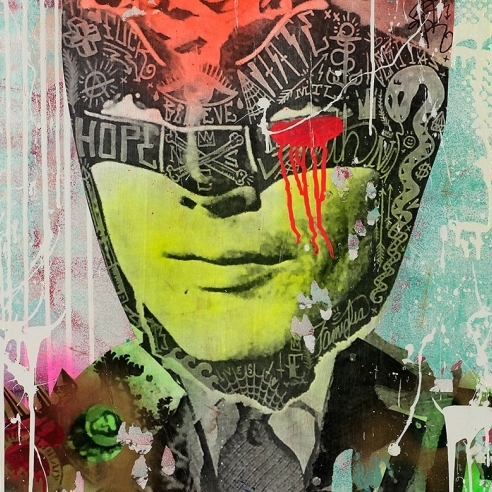 Often working on the street and in his studio, Dain combines silkscreening, acrylic, collage, wheat pasting, and spray paint. He begins with a classic black and white portrait and layers advertisements, logos and other images. 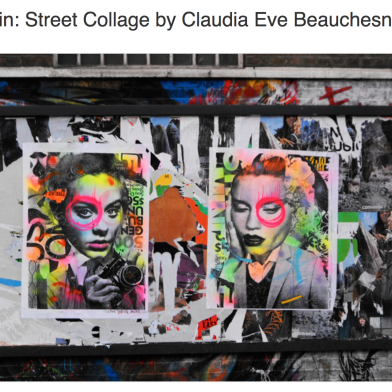 His pieces are then treated with both acrylic and spray pains as they morph into collages of stunning beauty. Dain's final and most distinguishing component is when he marks them with "the circle drip" around the eye, usually in bright neon pink. Internationally renowned, Dain's work has made its way into the famed Museum of Urban Contemporary Art in Berlin, Germany. He is the only American included in this extremely limited collection. He has exhibited both solo shows and in collectives in Paris, Berlin, New York City and of course his hometown of Brooklyn. 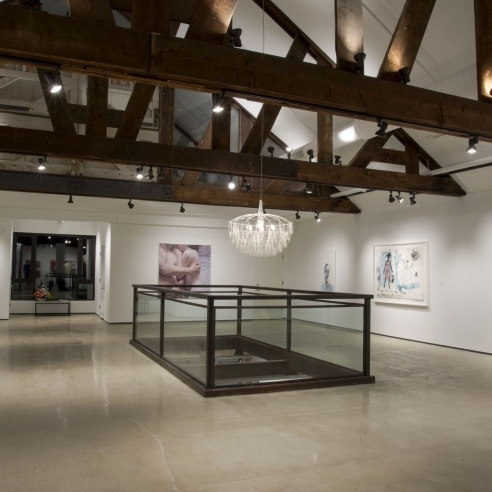 Detour gallery has been proud to include him in several of their collective exhibitions including CLASH: An Urban Collective. 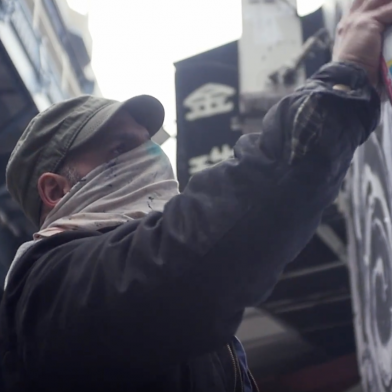 He has collaborated with famed Canadian street artist Stikki Peaches. 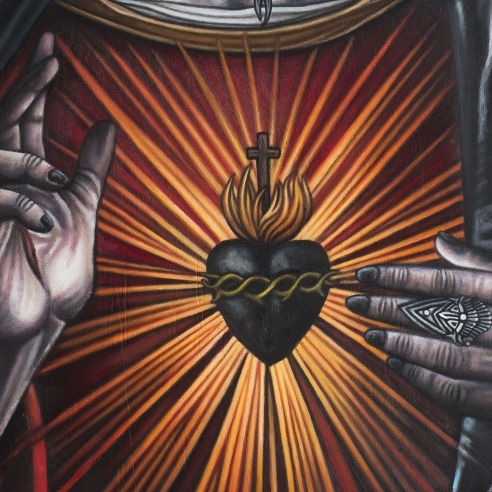 In 2018 the Coach fashion company hired Dain to paint a large mural in New York City for a product campaign and is a perfect match to haute couture his images have been utilized with fashion companies internationally.